It was six years ago this January that I began an adventure that started as an internship, then led to a job, which finally inspired me to pursue an M.F.A. in historic preservation. The place it all began was at The Patapsco Female Institute Historic Park, a stabilized ruin of a nineteenth-century school for young girls. This site is brewing with urban legends but its real story is much more fascinating, as I would start to uncover its secrets and stories each time I came to work. Overlooking the valley below is Ellicott City’s Historic District, a unique downtown area characterized by granite buildings constructed by the abundantly available local stone. More reminiscent of a European village than a Main Street in the U.S., this district made the Endangered Maryland 2010 list and was a new addition to the Preservation Howard County Endangered Sites for 2010. The city was founded in 1772 by the Ellicott brothers who developed a prosperous and innovative mill village, a tradition which has continued to the present day with the Wilkins-Rogers flour mill operating on a site near one of the Ellicott’s original flour mills. In addition, the high concentration of historically in-tact structures creates an atmosphere and sense of place completely unlike anywhere else in the state. A victim of various fires and floods occurring over two centuries, the downtown area stands testimony to the historic preservation efforts of concerned citizens and property owners as well as the generated volume of interested tourists visiting each year. Ellicott City to me has always been a place of intrigue. My first visit to the downtown was when my band played a show at a small record store called The Sound Exchange, all the way back in ’98! The architecture and the overall vibe of the place just spoke to me and I felt a strong attachment from the beginning. I didn’t get much of a chance to make the 45-minute drive from my parents’ house in Bowie but in undergrad the opportunity to intern at the Patapsco Female Institute presented itself and I was once again making the journey to Ellicott City. As I sat a traffic light on Old Columbia Pike waiting to turn left on Main Street, the snow swirling around the Howard House Apartments (originally a 19th century hotel) captivated my imagination and made me feel as though I was entering a different time period. Making the sharp right onto Church Road, I embarked on my ascent to the highest point in the city, all the while observing the sundry arrangement of architecture: granite single-family homes, churches, even a house designed to look like a castle of the original owner’s European ancestral home. At the very top of the hill stood the sublime ruins of Patapsco Female Institute. Its setting made it so easy to picture what the building must have looked like when it was filled with optimistic young students and their esteemed educators. 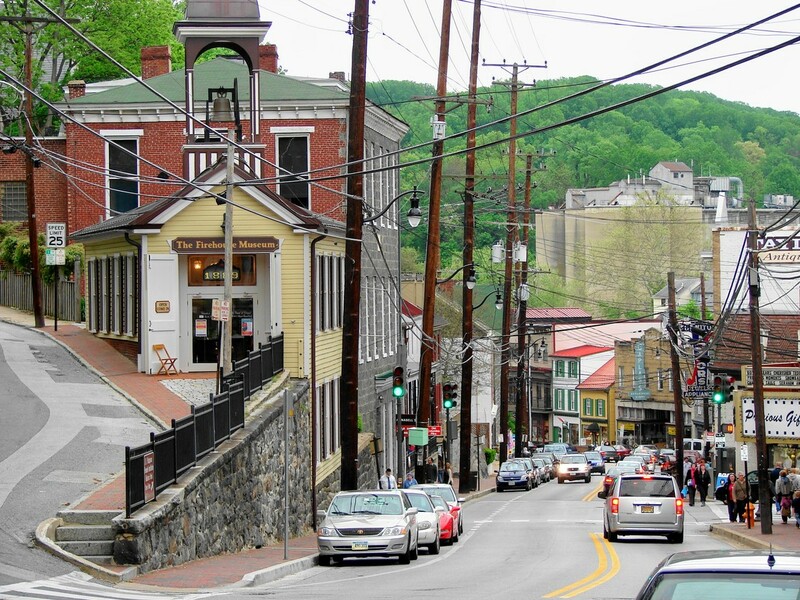 I continued a close association with Ellicott City, becoming well-researched in the city’s history by giving interpretive tours of the historic sites and participating in the local culture. The fact that this historic district is endangered is alarming but the good news is that we have the power to change it and there are enough citizens-despite the distance,myself included-willing to fight against the infiltrating development around Howard County, thus maintaining the integrity of this incomparable city. Main Street, Ellicott City, MD facing toward the Patapsco River.